Happy Hump Day! I tried uploading a video last night for the second night in a row but once again, YouTube aborted it. Dern! Usually I just do it before I go to bed and it's there in the morning, but this time I'll make sure and watch it until it completely uploads. 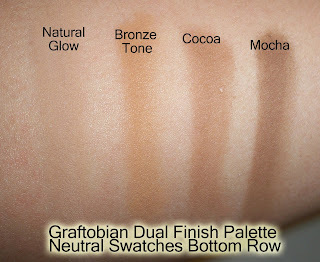 Meanwhile, i wanted to share with you some swatches of a kit essential - my Graftobian Dual Finish Palettes. 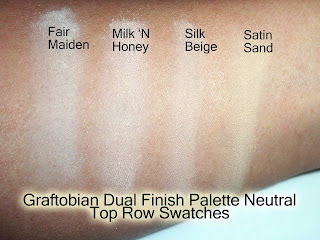 My girl/fellow blogger/Filipino Hottie Christiana asked me to swatch them for her. Since I took the time to label them and make them nice and pretty in photoshop, I thought I'd share in case some of you were interested. First off, these palettes contain powder foundations that can be used wet or dry. You can use them alone as foundation, to set makeup, and to contour and highlight. There are 24 shades to choose from. You can probably compare them to MAC Studio Fix Powder foundation but they're not quite as thick. I first bought the palette from http://www.camerareadycosmetics.com/ when building my kit. I've used this many many times. When I first started out, it was a God Send! The powder is smooth and pigmented and photographs nicely. Translucent powder looks ashy on darker skin tones so I'd use this palette to set. Also, if my first application of cream/liquid foundation was a bit off I would just apply the powder on top to correct it, problem solved! It's easy to color match since all the colors are laid nicely on a palette...I'll sometimes even dip my brush into multiple shades to get the perfect combination. 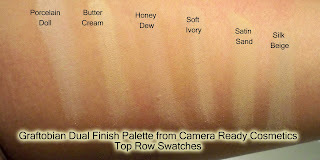 Click here to see swatches and more! 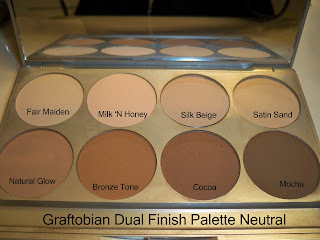 Here's a shot of the Neutral Palette from http://www.graftobian.com/. I'll often use this one on myself for quick foundation, or even to highlight and contour. This size is smaller than the one for CRC so it fits conveniently in a kit or drawer. If you're looking to build your kit with these powders, they are very affordable. You can get the pre-filled palettes for $79.99. This includes the magnetic palette ($11.99) and 8 pans of foundation ($8.50). The size is perfect for the kit and will last you a long time. Compare $8.50 vs over $25 from MAC. If you decide to get this for your own personal use, they have the larger size that comes with a compact and mirror for $18.99. In sum, I highly recommend this product. Whether you get the individual powder or the palette, it's worth a try. You can find these at http://www.graftobian.com/. Better yet, I just saw they'll be at IMATS LA this year. Yay! FTC Disclosure: I bought the original palette with my own money. The second item was later provided for review. I have not been paid to write this review and am not affiliated with the company. These are my honest thoughts. I purchased the cream foundation palette from CRC, and I was looking into getting these too. Thanks for posting this. thanks for this review! i wish/need to check if the ben nye powders come pressed. it would be great to have them in a palette. these palettes are tempting. i wasn't crazy about the feel of the hd creme foundation ;T can't wait to try rcma though! i bought this on your recommendation and i love this! it's perfect for those starting out in makeup art. i still use mines! This was an awesome post! Thanks for requesting Christiana! I need a palette just like this. Powder is something I'm lacking in my kit. Thanks Renny Poo! oooh great palatte!! thanks for the awesome review i might just have check it out! like all your other 3,000 followers, i love ur blog! how do u use them wet? I would love to have a chance to win the concealer palette so I can build a makeup kit but my funds are low. thanks for the videos I learn alot from them. P.S I am saving up for the Graftobian airbrush system, and I was wondering is there a coupond code avalible? Thank you for your time? Which color would you recommend for someone who is pale (think NC15) with quite yellow undertones?